Get rid of that excess air and serve your customer the best pizza pie using this pizza bubble popper! Eliminate doughy bubbles which take up space by using this handy tool to reach into the oven to pop them, giving your friends , family and customers the fullness of your famous pizza sauce and taste! The 30″ stainless steel with rubberized handle is perfect for deep ovens and offers a comfortable yet secure grip. The long handle will let you use the bubble popper in any oven without fear of being burned. 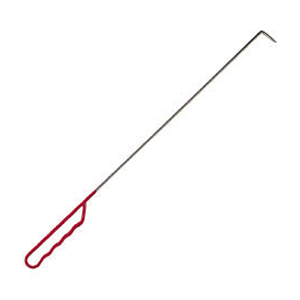 Also, the prong end is made of stainless steel, which makes it resilient and easy-to-clean.